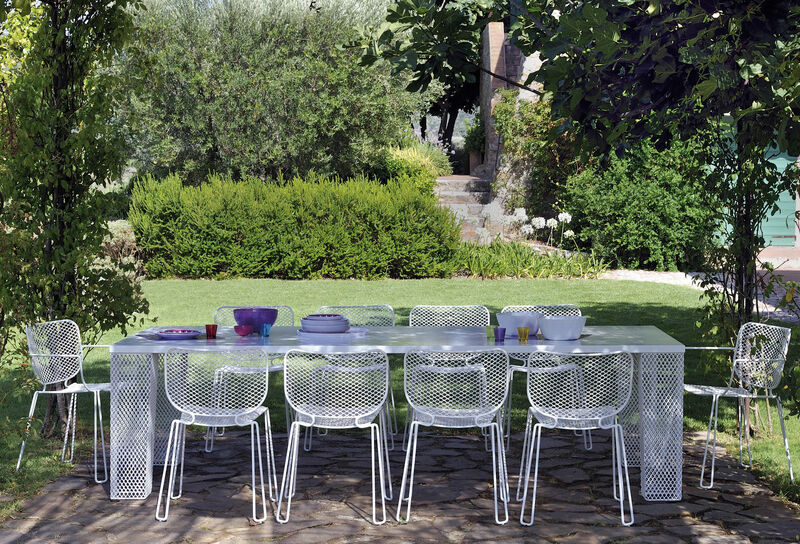 "The new IVY collection designed by Paola Navone for Emu is inspired by the ancient "topiary" art, the trimming of trees ad shrubs in order to give them ornamental shapes.The italian designer has designed sculpture-furniture created for living in and beautifying outdoor areas, structures created using the natural material par excellence - metal - bent to the will of the human mind. The meeting between the designer and Emu made it possible to mold an apparently hard material such as metal, obtaining three-dimensional shapes so light that they give the impression that they could float in the air. The structures of sofas, armchairs and table, empty inside, incorporate nature and become an integral part of it thanks to their noninvasive character, which harmonizes with the surrounding landscape. They are objects created to be left outdoors nonchalantly, furniture that will allow itself to be """"eaten up"""" by ivy like statues, and those who sit on it will fully experience the feeling of being immersed in nature. Paola Navone found herself dealing with a metal manufacturer for the first time, discovering it to be an industrial concern using advanced technology, but at the same time with strong local roots. "